Nice composition. The chobi color is warm and rich. Bold border - field relationship. Uzbek finishes, look at kilim ends. Small bleed under tank. 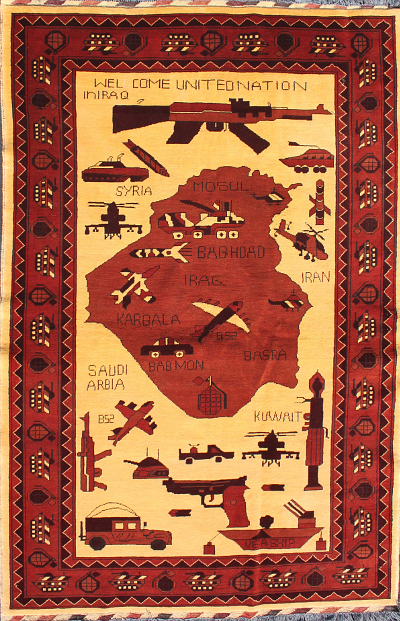 Top of the rug reads "WELLCOME UNITEDNATION in IRAQ" with the second 'L' in WELLCOME whited out on both the front and back. Damage: Some stains and spots from its time at a show, 'Weavings of War: Fabrics of Memory' then to 'City Lore' where it lived in their office for years.